First Line: I have never been what you'd call a crying man. That's what high school English teacher Jake Epping will tell you, if you were to ask. But while grading essays, he's blown away by what GED student and janitor Harry Dunning has written. Somehow, some way, fifty years ago Harry survived his father's sledgehammer slaughter of his entire family. Jake is still thinking how life can turn on a dime when he learns of an even more bizarre secret: Al, owner of the local diner and Jake's friend, wants Jake to take over his obsession. Many years ago Al discovered a time portal in the diner's storeroom, and he's been trying ever since to prevent the assassination of President John Fitzgerald Kennedy. Jake allows himself to be persuaded, and when he steps through the portal, he finds himself in the era of Elvis, cheap gasoline, and almost universal cigarette smoking. Jake has plenty of time to start a new life in small town Texas, but each day draws him nearer to a troubled loner named Lee Harvey Oswald. Will he be able to accomplish what Al tried and failed to do? And if he does stop the assassination of the president, what sort of consequences will there be? I have to admit that I held off reading this book for a long time. I was in third grade when JFK was assassinated. Yes, I remember exactly where I was and what I was doing when I first heard the news. For reasons that don't need to go into a book review, this event hit my mother and I hard, and I was reluctant to rip the Band-aid off that particular wound, even if it had healed long ago. I should not have worried, and I should not have waited. This book has very little to do with JFK and everything to do with Jake Epping. Stephen King's main character takes us all on a nostalgic yet honest journey through America during the end of the Eisenhower administration. Everything is brought to life in vivid and loving detail. I enjoyed reliving the era of my childhood, but as I read, I found myself thinking more about recent American history, its might-have-beens... and about love. Few writers can immerse me in their fictional worlds so completely as does Stephen King. No matter how strange, King creates characters and backdrops that are familiar and that I can trust-- which is a very good thing because I need someone/something trustworthy at my back while I'm reading to figure out how to escape his weirdness! If you've been postponing reading this book for the same reasons I did, you can stop. 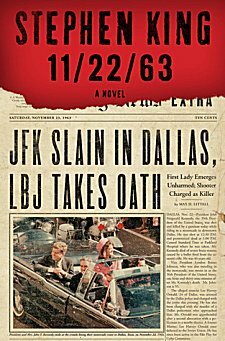 When you read 11-22-63, you're going to read a lot more about love than you will about bullets and lone gunmen. I hesitated to read this one because I thought it would be horror. I listened to it on audio and just loved it! For some reason, I can go with King's brand of horror when I'll leave everyone else's alone. I've never been able to figure it out. I really enjoyed this one too. Such a departure from Stephen King's norm, but it worked!